See post #9 in this thread, it is pretty plain in my mind. Yup, post 9. Not post 1. Nowhere in any of this does it say if I order the SS upper I'll get bumped to the 3rd run...... I ordered as you suggested before April 15th so I would get my set before 2020 and save $100. Now if I want my set from the second run I have to "upgrade" to the FA upper and pay more anyway....What was the point of getting in on the second run then I have to ask myself if I end up either A, waiting or B, paying more. Am I missing something here or misunderstanding something? All the info you claim wasn’t provided is right on the ATRS Modern Sporter ordering page. 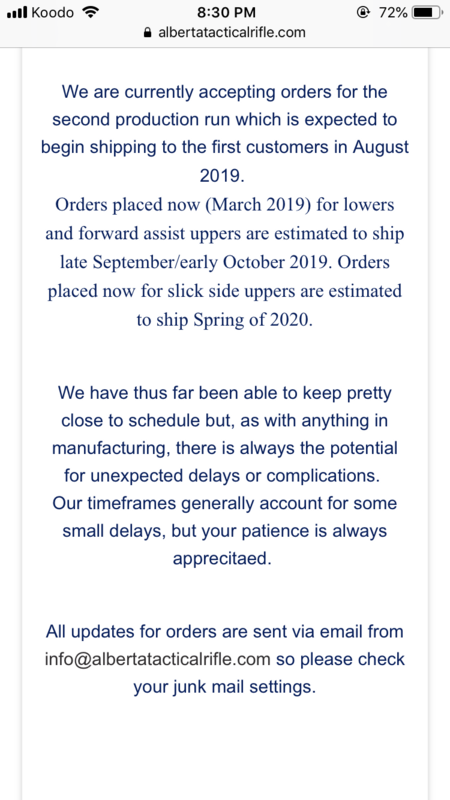 And being April 16th now production run #2 orders are now closed. All orders placed now will be put into production run #3. Once we have further info as to when receiver sets will be closer to being ready for production run #3 we will update accordingly. The plan at least for now is to finish out the F/A uppers then switch over to making lowers for run #2 and run #3, then reset up the mills for SS uppers then F/A uppers.